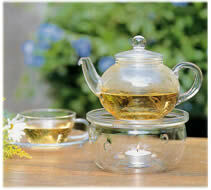 Avenue 18 carries glass teapots from Germany and Japan with best quality and best design. The glass teapots match with fruit tea and herb tea ideally to present the beautiful colour of the tea and enlighten the atmosphere of enjoying tea tasting. There are also ceramic teapots, porcelain teapots and in different material like stoneware and steel teapots for different kind of tea ceremony, many choices for drinking English Afternoon Tea, Japanese Mocha, Chinese Tea, Formosa Oolong Tea, and other occasions with tea tasting. HARIO manufactures products in favor of the clean environment and the human ecology. HARIO. This name means the "King of Glass." As the king of Glass, ever shining brilliantly, HARIO GLASS has addressed positively the environmental problems since early days. For example, HARIO selects only safe materials, uses only healthy 100%-natural resources, recycles limited resources, and never emits any industrial waste that may pollute the air or be harmful. We have always aimed at harmonization between and improvement of human beings and the nature. Avenue 18 has been carrying Hario product in North America for more than 10 years. Tokoname is a city located in Chita District, Aichi Prefecture, Japan. It has been associated with ceramics production since at least the Heian period, a division of classical Japanese history, running from 794 to 1185. Tokoname is the largest and oldest among Japan’s six ancient kilns (the others are Bizen, Shigaraki, Tamba, Seto and Echizen), and extended the market throughout Japan via sea. Tokoname red-clay-ware was invented in the early 1800’s which developed into the production of tea-ware like teapots and cups for Japanese green tea. In the 1900’s mass production was introduced which resulted in new production systems and improved kilns that produced ceramic pipes, bowls and jars. When looking for a teapot for green tea, you can't go wrong with a Tokoname handcrafted teapot. It is said that white pottery stone was discovered by Ri Sanpei in Arita Izumiyama and made porcelain first in Japan. The Eizaemon Fukagawa founder, Matasiro Fukagawa started to manufacture pottery in Arita. In 1870, by the command of the Ministry of telegraphic communication, the 8th Eizaemon Fukagawa succeeded in manufacture of the insulator for telegraphic communication first in Japan, and established the organization of “Koransha” with some companion. The unique styling and beauty of the Koransha group soon gained international recognition, the grand prix in International Exhibition in the US in 1876, gold medal in the Paris International Exhibit of 1878. Another honor award in Paris in 1900 followed by other awards of distinction prompted the Japanese Imperial Household to order their porcelain from the KORANSHA. Lin's Ceramics Studio chose "tea"as its brand name and target because of the broad and profound cultural implications. 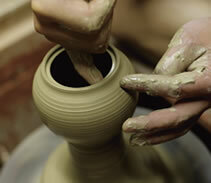 Starting from make a small pot, it has now become an innovative brand name in tea wares in Great China. The thehouses as well as an important element in tea culture. In addition, Lin's Ceramics Studio was also a sponsor of the Tea Serving Presentation in Taiwan Pavilion Expo 2010 Shanghai China. Today, Lin's Ceramics Studio is a brand name for tea wares as well as the symbol of the pioneer in tea craft and culture. Lin’s Ceramics Studio believes in “creating every piece of work with artistic mood, professional know-how and practical consideration”, and utilizes different materials to bring out the unique characteristics of each tea to allow its audience to experience the subtle differences between degrees of fermentation. JENAer Glas products are made of high quality borosilicate glass. Modern melting and processing technology, together with quality management, create the high quality of JENAer Glas products. For preparing tea, JENAer Glas procuts offer ideal conditions. 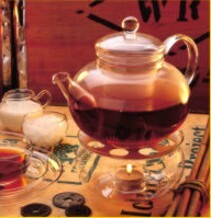 The specially designed tea ware enables an optimal developing of the aroma. They are dishwasher proof and suitable for microwave use. The glass is particularly pervious to microwaves and microwave grills. The products feature high heat resistance up to 450°C in the long term and 500°C in the short term. JENAer Glas products boast high quality and help to brighten up your day with functionalism and good design. Many efforts come to fruition in each cup & sauser. All the cups and saucers of MARUI are made in Japan, where all aspects of the process are carried out, including obtaining the raw materials(clay, glazes), molding, firing, design and decoration. Their shapes convey the delicacy and grace that are the hallmarks of Japanese style. Various techniques are employed in their patterns and gold finishes. Although they are western-style tableware, they also suit Japanese style interiors, which is a distinctive characteristic of products from MARUI.